Wind gusts, passing semi-trucks, and other factors can cause trailer sway, making towing a white-knuckle experience. 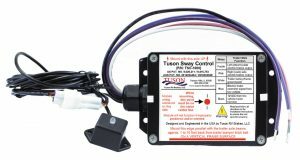 Among the systems designed to keep sway in check is the Tuson Sway Control from Tuson RV Brakes. Tuson’s patented electronic system is wired into the trailer brakes. The system is asymmetric — braking operates independently on the left side and the right side. The system continuously monitors for sway, and once it is identified, braking is applied to one side of the trailer to provide greater stability with minimal speed loss. 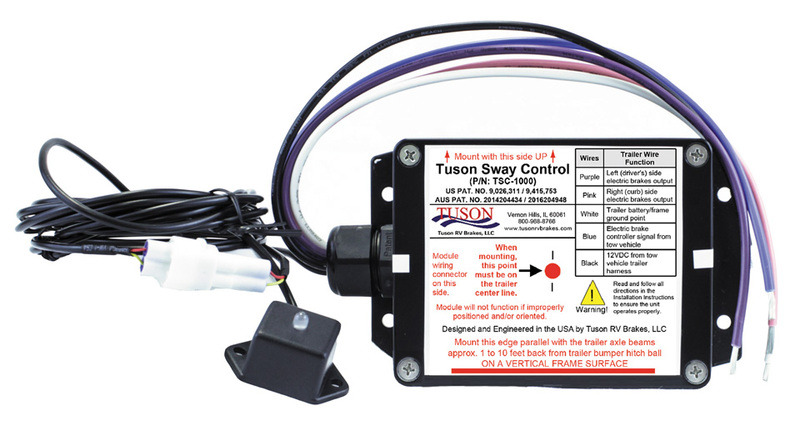 According to the product description, the Tuson Sway Control automatically adjusts to improve braking performance, even during off-road towing. The price is $550. Fast recovery time and long life are said to be among the chief benefits of a line of 6-gallon RV water heaters recently introduced by Suburban, a division of Airxcel Inc. Suburban Advantage water heaters feature a residential-style porcelain-lined steel tank and are designed to replace water heaters with aluminum tanks. Recovery time varies depending on input water temperature. Operating on propane and with an input water temperature of 30 degrees Fahrenheit, the Suburban Advantage recovers 8.48 gallons per hour. When propane and an optional electric element are combined, the recovery rate is 14.58 gallons per hour. The heater’s anode rod protects against tank corrosion and doubles as a drain. Flue tube baffles slow the combustion process to transfer more heat to water in the tank. The price begins at $489.55. Used to be, we all screamed for ice cream. (Okay, some of us still do.) These days, you’re as likely to hear people clamoring for a charger to keep phones and other devices powered up. The X5 Car Charger, from RapidX, simultaneously charges up to five devices. 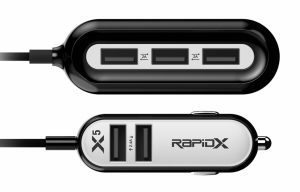 It’s especially handy if you’re in a truck, SUV, or car, because the extended multiple USB charger hub means people in the front seat have access to two USB ports while people in the back seat can get juice from three USB ports. (A 5-foot cable connects the hubs.) The X5 is powered by a 12-volt vehicle outlet/cigarette lighter and is available in eight colors. 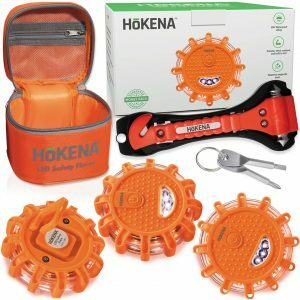 The manufacturer’s suggested retail price is $24.99. When darkness falls on a campground, a hands-free light can be an essential item for walking Fido, making a minor engine repair, baiting a fishing hook, flipping grilled burgers, reading a romance novel while sipping chardonnay . . . the list goes on. The Foxelli MX20 Headlamp Flashlight is powered by three AAA batteries (included) and features a range of light modes (including a red light and SOS) with a maximum brightness of 165 lumens. The water-resistant headlamp weighs 3.2 ounces and has an adjustable head strap. It’s available in six colors. The price is $12.97. 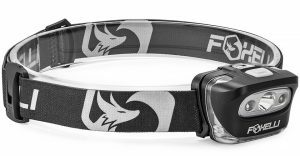 Foxelli also sells rechargeable headlamps. 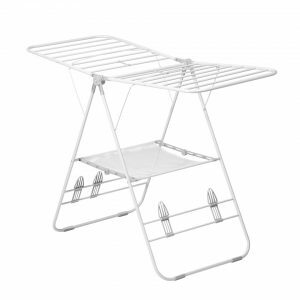 The Heavy-Duty Gullwing Clothes Drying Rack, from Honey Can Do, provides 46 linear feet of drying space. You may find it useful if you’re in an RV park that forbids hanging clothes on outdoor clotheslines. The rack can be configured into six positions. It’s 57 inches long, 23.5 inches wide, and 37 inches high, and folds down to 3 inches flat for storage. It features steel support arms, a sweater shelf, and a shoe-drying rack. The price is $39.99. Thump. Owwww! A fall from a bunk bed is no fun, so everyone will rest easier knowing that the occupant of your RV’s bunk bed is protected from such plunges. And that’s where the Bunk Bed Safety Net from Organized Obie comes in. The mesh net — made from material similar to warehouse safety nets — measures 17 inches by 45 inches. The net is secured by screws drilled into the bunk’s bottom frame and into the ceiling. When ready for use, the net is held in place by adjustable straps with seatbelt buckles. When not in use, the net tucks under the mattress. The price of the Bunk Bed Safety Net is $98.99. After a vehicle breakdown or accident, the last thing you want is to accidentally set roadside vegetation (or yourself) on fire by igniting safety flares. An alternative: Hokena LED Safety Flares. A kit includes three reusable flares, each powered by three AAA batteries (included). The flares, which have a magnetic back, are said to be waterproof and crushproof. Users can select from nine lighting modes, including SOS and a built-in flashlight. Each kit includes tools to replace the flares’ batteries, as well as a combination window breaker/seatbelt cutter tool and a carrying case. The product is sold only on Amazon. The price is $35.99. One day, Darrell Abts’ wife asked him to turn off their noisy RV air conditioner. But yikes, it was 90 degrees outside! Darrell began seeking a solution, and the result is the RV A/C Silencer, which he markets through his company, WackO Products. 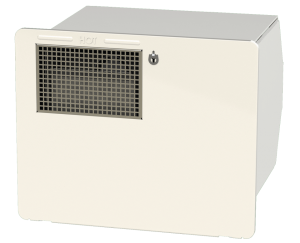 The product fits Dometic and Coleman air conditioners with a ducted system (learn more about that on the WackO website). 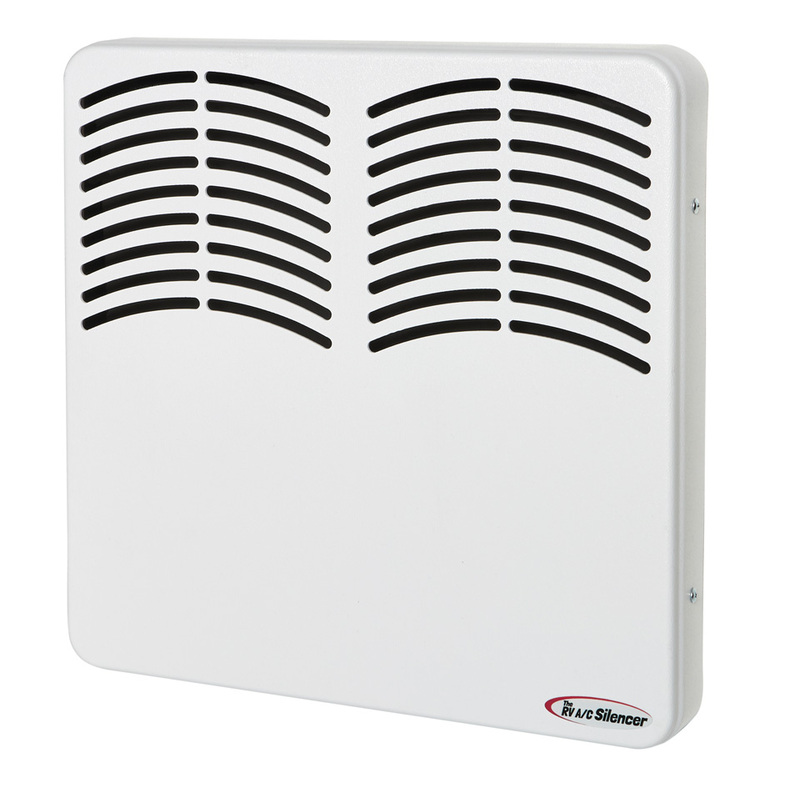 Noise is reduced in various ways: by sound-deadening pads; by the cover, which is designed to reroute air as it enters the A/C; and by an air filter that not only blocks pollutants but also has sound-absorption properties. Installation requires no drilling and takes about 15 minutes, according to the product description. The price is $189 for an RV A/C Silencer for either Dometic or Coleman air conditioners. Rod and Dreama Yohn are campers who ran out of room on their truck for a kayak. 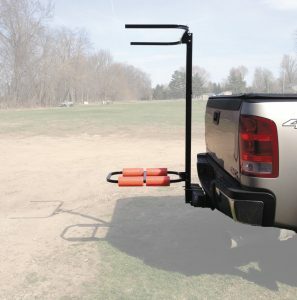 So, they developed the VertiYak, a vertical hitch-mount rack for transporting one or two kayaks or paddleboards up to 12 feet long. It can be mounted to a standard 2-inch receiver. Kayaks must be able to fit in the VertiYak’s lower cradle, which has two openings measuring 11.5 inches by 17 inches. And, kayaks must be secured with two ratcheting-style straps, which are not included. The lower cradle support has holes for three mounting heights, so be sure it is installed with adequate ground clearance. Also important: If a mounted kayak extends above the roof of the RV, be aware of overhead obstacles such as low bridges or limbs. The price of VertiYak is $369, shipping included.